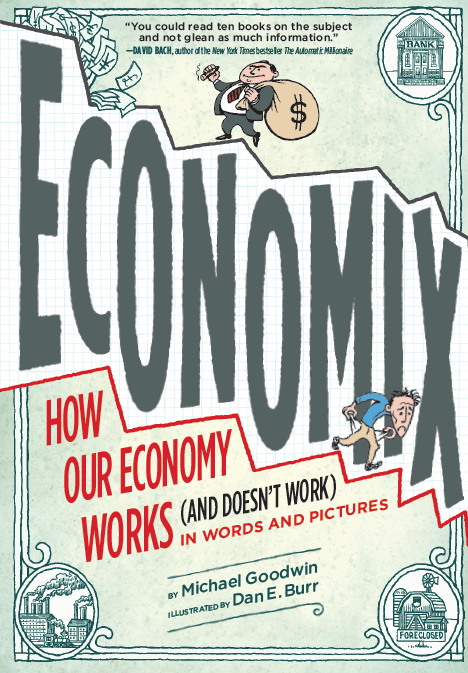 I recently picked up the 2012 book Economix: How Our Economy Works (and Doesn't Work). It's a crash course in economics put together in the form of a comic. Author Michael Goodwin notes in the preface that he wanted to relay what he thought was the broad story of economics, but he chose comics as the medium because it was more accessible than anything else. There are a couple problems with studying economics, generally speaking. First, it lies in this weird intersection of social science and math. Which means that it has the hard and fast rules of arithmatic, but with a lot of fuzziness that one might see in sociology. Which means that right-brained people have trouble with the analytical half of economics, while left-brained people have more trouble with the fact that people don't neatly fit into mathematical constructs. Second, in part because of that intersection, economists frequently don't fully understand the subject themselves. That's why you see what amounts to guesswork in even the most highly visible economic jobs in the world. And because of all that, economics comes to the table with a bad rap. People are fearful of studying it, and if they are forced into an economics class, they subconsciously set themselves up for a difficult time. They expect teachers that talk in Ben Stein's monotonal voice, and to fall asleep as soon as they open the textbook. 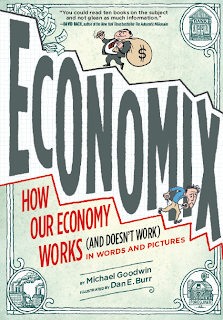 So, coming from that perspective, it's kind of gutsy to cover nearly half of the cover with the word "ECONOMIX." There's only so much excitement and interest an "X" can add to the word. What's also challenging is that, in flipping through the book, it still looks pretty text-heavy despite it being marketed as a comic book. It is indeed fully illustrated and laid out in a comic format, but there's a lot of very full dialogue boxes and speech balloons. In reading through, it does feel a bit like Goodwin didn't write this as a comic. Or rather, he doesn't have experience writing comics, and his script was overly reliant on prose. But, the text itself is casual and relatively approachable. There's still some daunting subject matter to cover, but I found Goodwin's examples helpful in explaining everything. What I'm unsure of is how easy the text would remain if someone is trying to decipher economics for the first time; I have more than a few econ classes under my belt, so this was more of a refresher course for me in that sense. But it seemed easier and less convoluted than any of the textbooks I used. In some respects, the book felt much like those white board style videos, in which an expert on some subjects talks for a few minutes while an artist provides cartoon illustrations on a dry erase board that coincide with the speech. I think that's they real key on which Economix hinges. If you just sit and listen to one of those videos, the talk is engaging enough, but can sometimes be monotonous to sit through. But by adding the illustrations, the viewer is more directly engaged with the content and is able to visualize some of the concepts in a more concrete fashion. The same holds true here: Goodwin's text by itself might be serviceable, but the illustrations are what draw readers in and focus on the material more directly. Which leads me, of course, to the artist here: Dan E. Burr. Burr does a solid job interpretting Goodwin's text as illustrations. His generic characters are fairly simple and therefore rather approachable, but he also does a great job capturing the likenesses of historical individuals and keeping them in the same style. Even though it's not really relevant to the reader what, for example, Léon Walras looks like (he appears in exactly one panel in a non-speaking capacity) it's still good to see that Burr's done his homework here. The only thing I might criticize about the artwork is that the backgrounds are a little too sparse, too often, in my opinion. Frequently, backgrounds are not included at all, leaving the figures on a stark background or, on occasion, with just a bit of cross-hatching in the corners. With the generally hevay text throughout the book, I think filling up some of the blank space with denser illustrations would have helped to break up the page a bit more visually. Economics is a daunting subject, and even the comics version here clocks in at over 300 pages. But Goodwin and Burr do a good job bringing it down to a manageable and digestable level. Given that the economy, in some capacity, is almost the de facto headline of every newscast, I think it's a subject many more people need a better understanding of. And if you've been intimidated by it in the past, or if you're just not sure you want to wade through a slog of dry textbooks on the subject, Economix is a fine choice for getting yourself acquainted with the topic.